Posted on behalf of International Student Support as part of the International Perspectives series. 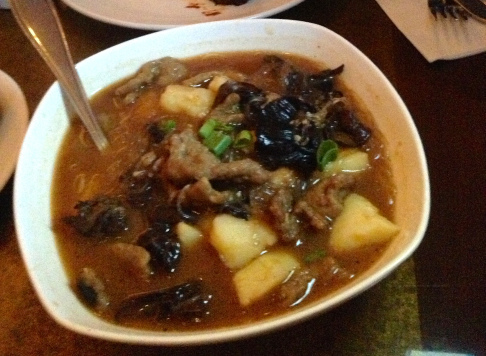 Have you ever tasted Tibetan food? It’s fantastic! 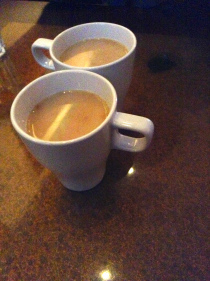 The first time I tried it was in Tibet Kitchen, a cozy restaurant located in the Parkdale neighbourhood. My friend and I took a streetcar from Queen Street towards Humber to get there. For the first 15 minutes we cruised past ubiquitous retail stores, but when we approached Parkdale there were so many little shops selling the most random things. We almost got off a few stops early to explore them. Alas, we prioritized food over knick knacks and arrived on time at Tibet Kitchen. The restaurant had a modest look to it, with wooden table and chairs, a dimly lit interior and rugs lined up on the wall. It was simple but welcoming. Once we settled in, the friendly server swiftly took our order. To start us off, my Tibetan friend ordered the Tibetan tea, Bo-Jha. This tea wasn’t like English Breakfast or Earl Grey. Instead, it was rather creamy in colour due to one of its key ingredients — butter. I wasn’t convinced I wanted to try it, especially after my friend mentioned that Bo-Jha has salt. But after going through the cold weather and long ride, Bo-Jha tasted just fine. The taste of butter was unsurprisingly dominant but the salty jolt wasn’t overwhelming. For a butter lover like me, the beverage was a worthy new experience. The Tibet Kitchen special fried rice that we ordered turned out to be an ordinary plate of fried rice with shrimp. What was really special though was the steamed momo or beef dumplings. They were huge and meaty with chives and onion morsels. Upon my first bite, it tasted flavourful and juicy! My friend’s favourite dish was phingsha, sliced beef sautéed with chewy, black mushroom, glass noodle and diced potatoes flavoured with ginger peppercorn sauce. It came with steamed rice which made a delicious combination. 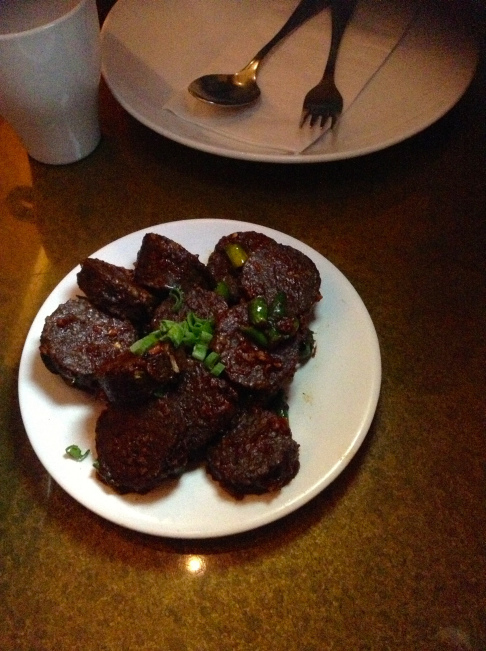 We were also served Tibetan beef sausages on the house. They had a mushy texture with pieces of chilli mixed in. I have to admit – they didn’t look all that tasty, but they tasted great! “It’s totally like what my mom cooks at home— love filled meals,” said my Tibetan friend about the food. And yes-even though it was my first time having Tibetan food, it reminded me of the last home cooked meal I had as well. Each dish costs around $10 or less, totally doable for a student budget. The portions were generous and the service was satisfactory. I want to come back and explore the area also! Afterwards, we went to a thrift shop nearby where I bought three hardcover books and one paperback for only $2.97 in total! It was all in all a great conclusion for an amazing dining experience. I totally recommend it!